If you’re in the market for an electric skillet, we’re going to guess that you’ve realized occasionally stove-top pans just don’t quite make the cut. While even the deepest skillets can be great, sometimes there is a need for deep-frying, baking, or keeping food hot while serving, and a typical frying pan just can’t satisfy those needs. That’s exactly where electric skillets come in! Not only can they help with large recipes, but they can also serve as an extra burner for holiday cooking. Let’s discuss more about electric skillets, which aspects create the best electric skillet, as well as review our top-rated recommendations. Why Use an Electric Skillet? Deep or Shallow: Deep, 2.87"
Deep or Shallow: Deep, 3.25"
Deep or Shallow: Deep, 3"
Deep or Shallow: Deep, 2.25"
An electric skillet is a cooking device with a self-reliant heating element. Typically, electric skillets are a few inches deep with a snug lid for holding a steady temperature. The depth of most skillets makes it a great option for frying anything, as well as cooking meals that require a great number of ingredients at once in a pan. 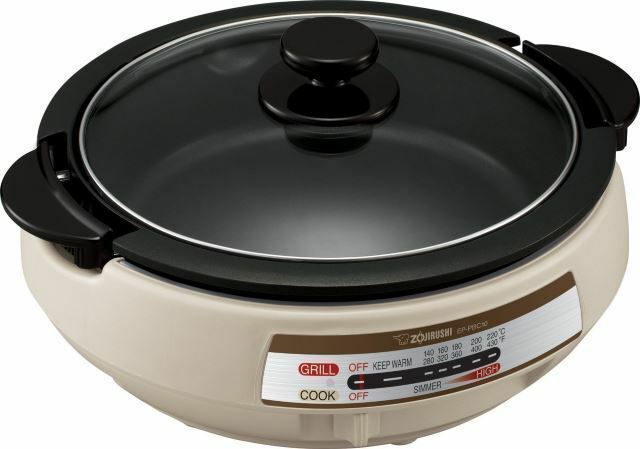 Electric skillets are plugged into a typical wall outlet and can be set to any desired temperature for specific cooking. For instance, at times it is easier to cook sausage or hamburger patties when the temperature can be set to a specific level, rather than guessing on the stove. 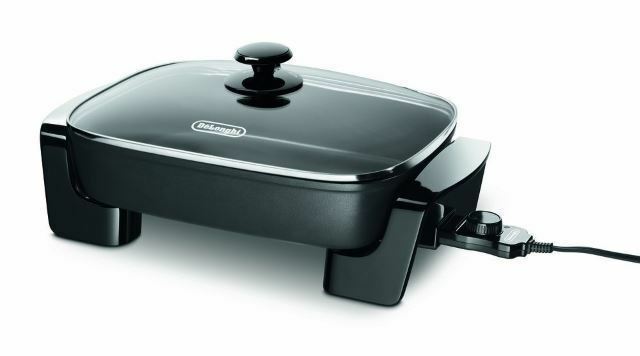 Additionally, electric skillets can come in handy for serving during a buffet when the food must be kept warm, or when additional cooking space is needed for large gatherings or holidays. Due to the fact that electric skillets work when plugged into any outlet, they free up the stove or oven for any other food you may need to cook. Thanks to the snug lid, electric skillets maintain their temperatures extremely well, which can give you a piece of mind if you are cooking meat, such as pork chops. Considering the lid keeps the heat mostly contained, cooking in an electric skillet can be ideal during the summer when you’d rather avoid heating up your kitchen with the stove or oven. Further, the lid provides a great option for searing meat without the hot juices splattering on both you and your kitchen appliances. Though you now know what an electric skillet is, let’s talk about the benefits of using one and what it can be used for. To begin with, let’s talk about frying food. Have you ever tried frying chicken, sausages, bacon, or even eggs and found yourself annoyed with the mess of residual oil splatters? The oil honestly reaches everywhere, and the splatters can be painful as they prick your skin. If those are bad enough, you don’t even want to try frying doughnuts, sopapillas, or anything requiring at least an inch of oil. This is exactly the situation that electric frying pans solve. With a deep pan and a tight lid, the heat and steam will circulate to cook your food faster, even bacon and eggs. Further, the lid will keep in all the splatters, which means less pain and cleanup for you. Finally, deep frying with oil is actually possible when you can rest assured it’s safely contained in the depth of your skillet. Have you ever been elbows-deep in preparing Christmas dinner, only to find you still need to prepare the green bean casserole? Perhaps that’s not the problem though; the problem is that the oven is completely full, as well as the stove top. What to do? Thankfully, did you know you can actually bake food in electric skillets? Not only do they provide an extra burner, and not only are they great for cooking, but they are definitely capable of baking as well. You can even make popcorn in an electric skillet! Finally, if you’ve spent your fair share of time in front of the stove, you’ll know that food can cook unevenly on stove burners. This is especially true if your stove’s burners happen to be coils instead of a grill top or glass top. Even if you have your pan covered with a lid, your food can still end up overly browned in one area and uncooked on the other. Not only do electric skillets hold a level temperature, but the appliance heats evenly. Even heating makes a world of difference for fluffy pancakes and perfect eggs! There are a few aspects to look for when purchasing an electric skillet. Before walking into a store and handing over your credit card, consider what exactly you’ll be using the skillet for, and where you’ll be storing it. The answers to these questions will determine which is the best electric skillet for your specific needs. For example, if you just need it at home for cooking family breakfasts, a smaller electric frying pan may be ideal (though of course, this would depend on the size of your family). However, if you are planning to use it primarily for holidays or for commercial purposes, a large skillet would be necessary. On that note, this is where shape also plays a part. In general, round skillets provide a fairly smaller cooking space, whereas oblong or rectangular skillets are larger. A standard, round skillet may feature a diameter of around 10 inches, which could be perfect for a small family of two or three people. Larger skillets with diameters of up to 14 inches would be the better choice for four to six people, while the extra-large skillets at around 16 to 18 inches would be ideal for large gatherings and commercial use. Along with determining the size and shape comes the need to decide where the skillet will be stored. Unfortunately, skillets tend to be rather bulky and may not fit well within cabinets. Before purchasing the skillet, you’ll need to determine where you can store it, or whether you’ll just leave it on the counter for frequent use. If you have cramped storage or counter space such as in an apartment, again, a smaller skillet may be a better option. Another aspect to consider when looking for an electric skillet is the range of temperature controls. Do you need something specific with the exact temperature, or does “high, medium, and low” work for you? Older and less expensive skillets may have the most basic settings, though they are increasingly harder to find as customers realize the helpfulness of exact temperature settings. If you plan to deep fry food, perhaps look for a commercial skillet that can reach up to 450 degrees, as many standard skillets only reach 400 degrees. Another helpful option is a “keep warm” setting. While this may not be a priority for you, it can come in quite handy for whenever you need your already cooked food to stay warm. Other features to keep an eye out for all depends on what you’re wanting to get out of your skillet. 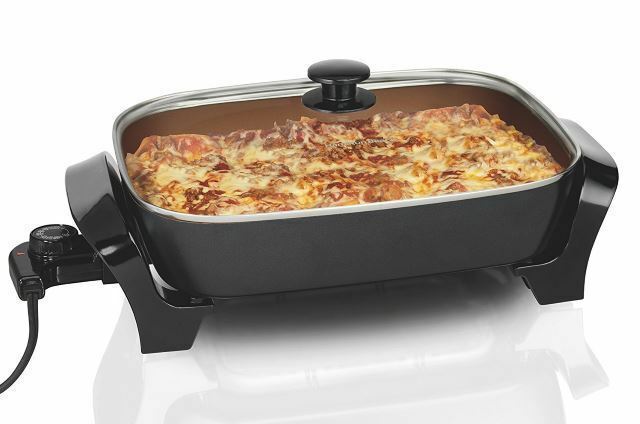 If you plan on frying foods or baking casseroles, you may want a deep dish skillet. If you are making soups or foods that need to be watched, a glass lid could be quite helpful. Regarding lids, some skillets come with locking and sealed lids, which could be very helpful for transporting the food in the skillet; for example, from the kitchen to a potluck or even the backyard. If you’d rather not deal with the mess, opt for a dishwasher-safe skillet. To further help with cleaning, dishwasher-safe models should have detachable parts. Additionally, it would be a good idea to look for a skillet with heat-resistant handles so you can easily hold the skillet stable while cooking and flipping food without worrying about burning your hands. Even with best-rated products, we would definitely recommend a non-stick or ceramic skillet for certain, as skillets tend to be used for high-heat foods and may become a pain to clean if they aren’t non-stick. Some people consider ceramic more durable than Teflon or vice versa, however, that is yet to be determined. What is known, though, is that the Teflon non-stick coating tends to peel and break down over time, which can end up in your food. Teflon may be more durable than ceramic over time simply because ceramic is a newer material, but consider that ceramic doesn’t have a coating and is also commonly viewed as an eco-friendly material. Presto has a full series of electric skillets, all with different purposes. This one, in particular, would appear extremely practical and may be a great option for those who need to serve several people but also have limited storage space. This skillet is designed from heavy aluminum with a non-stick coating on both the interior and exterior. It is especially helpful to have the exterior non-stick, considering food oftentimes spills over when cooking or sloshes over the side when serving. It can be a pain to scrub food spills, and that’s what is taken into consideration with this coating. Additionally, this skillet has a built-in pour spout, which can be helpful for pouring off liquids, as well as doubling as a spoon rest or vent. The best part of this skillet is its foldaway features. Unlike typical skillets, the handles fold down for the skillet to actually lift away from the base. This would make cleaning a breeze, but it doesn’t stop there. 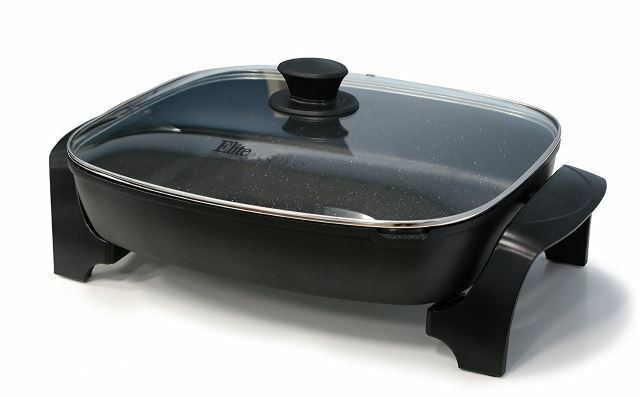 The base and handles can actually be stored within the skillet itself for extremely compact and streamlined storage. We believe this skillet would be a perfect match for individuals who need to serve large groups of people or cook large dishes, but also need an effective product for cleaning and storage. Typical skillets can be bulky or difficult to wash with the heating elements, but this skillet dissolves that issue by creating a removable base and handles for their dishwasher-safe product. This Elite skillet also places high on our list for electric skillets. This deep-dish pan will likely be up to the challenge for any large dish you may need to cook or bake. With a capacity of eight-quarts, you won’t be likely to run out of space anytime soon. The skillet sports a glass lid to easily keep an eye on your food without releasing all the steam, as well as a pour spout for pouring off excess liquids. As with the Presto skillet, the pour spout may be able to double as a spoon rest as well. The skillet is non-stick, which is certainly essential for frying chicken or other foods that tend to cook on. Finally, the most fantastic part of this skillet is that it can be fully immersed and it’s dishwasher-safe. Far too many electrical cooking appliances cannot be immersed, therefore often making it difficult to fully sanitize them. 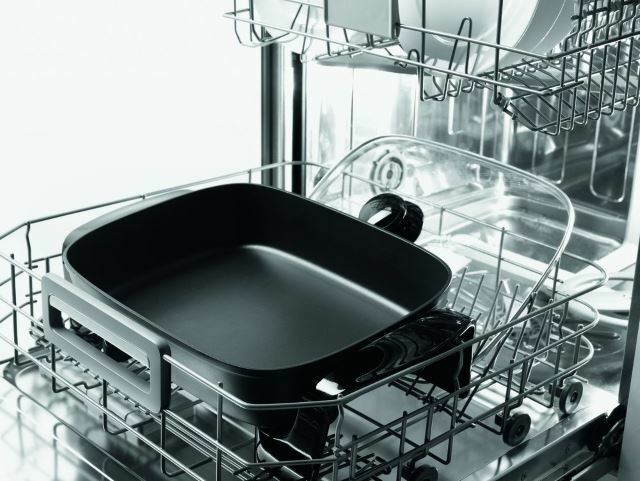 As long as the cord and thermostat are removed, the entire skillet can be set right in the dishwasher. No more tedious spot cleaning! 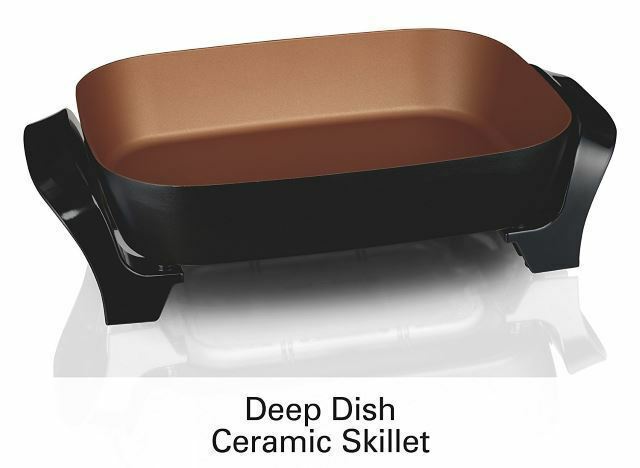 This skillet could be a fantastic choice for people who are looking for a large enough skillet with great depth to handle big cooking projects while needing a dishwasher-safe solution to ensure cleanliness. Ideally, those who are looking for this large of a skillet would also have ample storage space. If you are looking for a jumbo skillet to make your entire family’s dinner in one pot, then you’ve come to the right place. At 16” long, this skillet rivals most other products for spacious cooking surfaces. 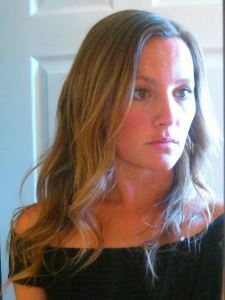 The product would be especially helpful for holidays and family gatherings! With adjustable steam vents, you can help your food cook evenly while reducing the risk of steam burns as you open the lid. On that note, the lid is crafted from tempered glass to keep the heat locked in for eliminating cold spots, as well as for keeping your cooked food warm! The glass also helps provide a great view of the food while it’s cooking to reduce overcooking. As for ease of cleaning, the interior and exterior are both non-stick, which may greatly help in eliminating cooked-on food. On top of that, the skillet is dishwasher safe. Just remove the cord and place it in the dishwasher for cleanup in a flash! The De’Longhi skillet is a great choice for anyone who needs a skillet that can handle large portions of food without spills or difficulty. It is especially a great choice for anyone who wants hassle-free cleanup and has plenty of storage space. While we have covered all Teflon non-stick skillets so far, let’s talk about ceramic! Hamilton Beach has released a deep dish, ceramic non-stick skillet for those of you who want the ease of cleaning without the chemicals of Teflon. Ceramic is a great solution to avoid any potential peeling of the non-stick coating a few years down the road and may respond better to metal utensils. The manufacturer describes this ceramic as “Durathon,” stating that is is apparently four times more durable than Teflon. We haven’t found studies to back up that claim, however, we can attest to the fact that ceramic is safer for our health than Teflon and maintains non-stick properties. Beyond the ceramic aspect, this skillet features a depth of three inches for easily handling most recipes, and provides ample cooking surface area at an impressive fifteen inches. The glass lid easily allows for close monitoring of your food, and both the lid and skillet are dishwasher safe! Simply remove the plug, and set in the dishwasher. This skillet could be a great choice for customers who need a skillet on the larger size, but don’t need the biggest size on the market. This will provide extra cooking space, likely without feeling too large. 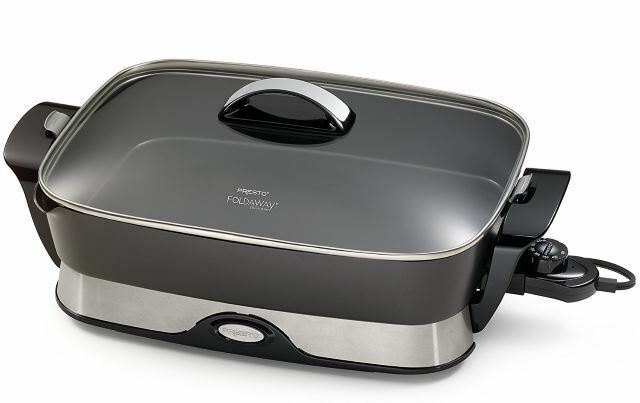 The electric skillet could also be a fantastic choice for people who want the non-stick and dishwasher safe abilities but without the Teflon chemicals. Our last selection is quite unique. This electric skillet is round and on the smaller size at around 10” in diameter. As with the previous skillet, this product is a ceramic option rather than Teflon, and it has a titanium-strengthened non-stick coating. The greatest thing about this nifty skillet, however, is the fact that the pan actually sits within the base, much like a slow cooker. 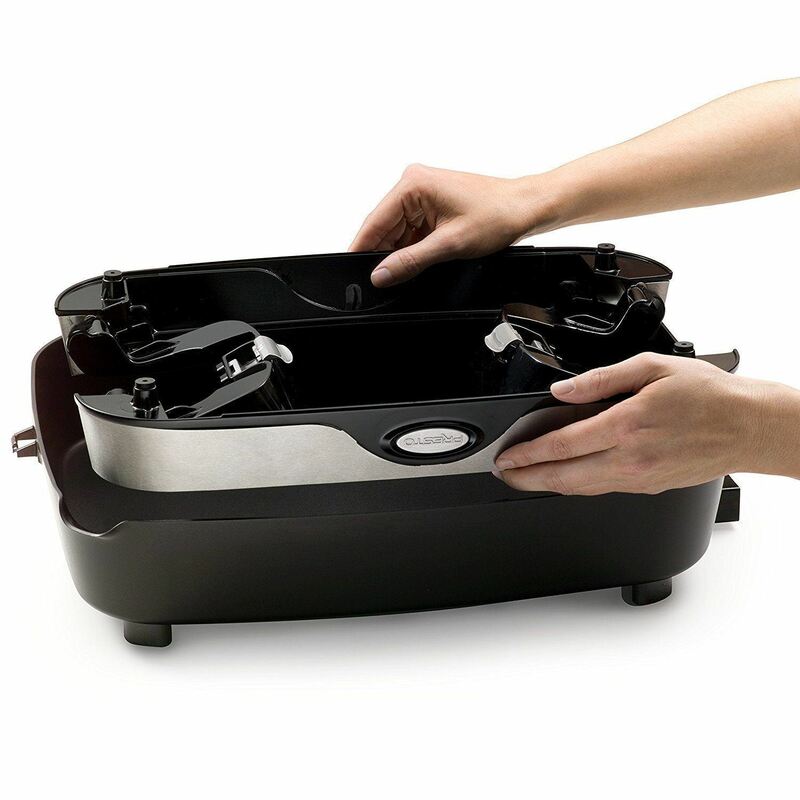 The skillet can be lifted from the base for easy and efficient cleaning. When removed from the base, the skillet pan may also be used directly on a stove burner for cooking or boiling water, which could come in handy if you ever need an extra pan. The handles stay cool to the touch, and the glass lid is tempered for safe and convenient monitoring of your food. This skillet sports a full range of temperatures, from “keep warm” to even reaching to 430 degrees, which is unusual for most. 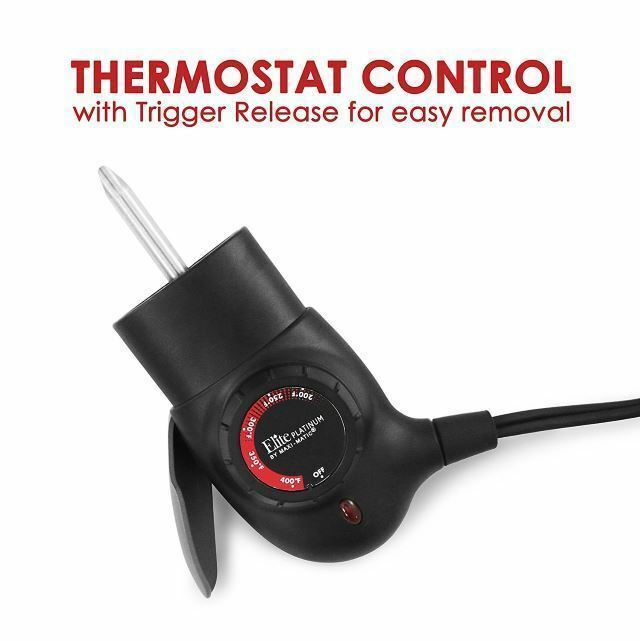 The temperature control is set by simply sliding a level along the base just under the controls, which can help with exact cooking. This durable skillet can be used for cooking or grilling. Additionally, some people enjoy cooking the meal at the table with their family members involved. This skillet would provide a fun option to make that social time happen! There are many safety features included in this design, making it a great option if you would prefer to use it for cooking at the dinner table. The features include temperature-safe handles, not only on the skillet itself as mentioned but also on the base for safe transportation. Further, the lid’s knob has a plastic shield to protect your fingers from accidentally touching the hot glass, and is flat so it can be placed upside down without rolling. This Zojirushi skillet would likely be a fantastic choice for customers searching for a smaller option. While this will still serve a few people, it would work well for those who don’t have as much storage space. Additionally, this would be great for anyone trying to avoid Teflon chemicals. 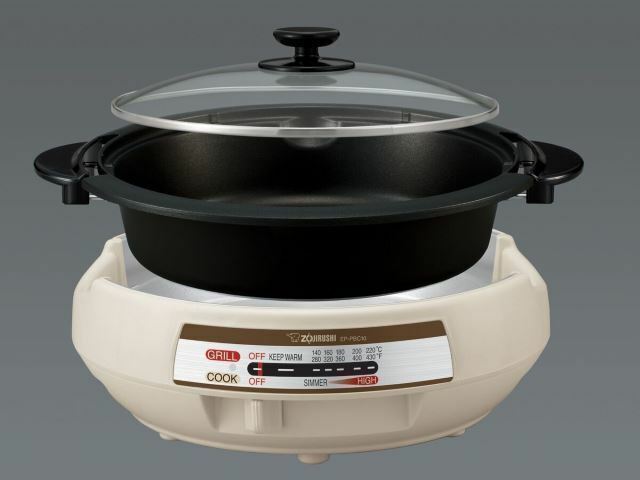 There are multiple criteria to consider as you make your selection from our electric frying pan reviews. Electric skillets should essentially be non-stick for preventing cooked on, fried foods. Their designs need to reflect consideration for cleaning ease, their handles need to stay cool, and even if the skillets are large, they need to be practical for storing. Efficient and effective design trumps all when it comes to electric skillets. For those reasons and more, we are convinced that the Presto Foldaway Electric Skillet is the leading electric skillet on the market. With its larger size, this could work well for individuals who need to cook greater portions of food. 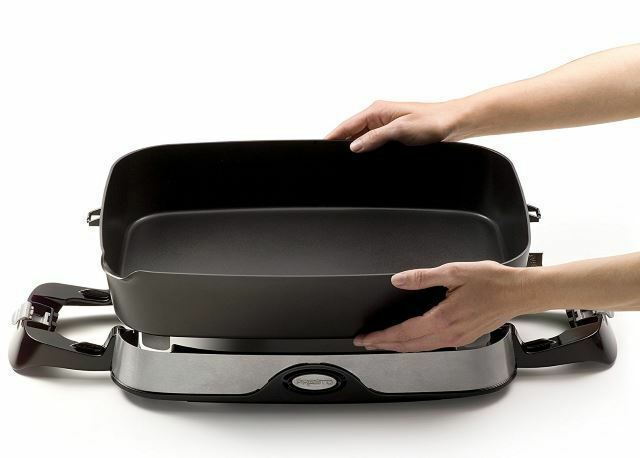 However, even if you don’t need a large size, this skillet neatly folds away to help reduce the bulk of storing it. 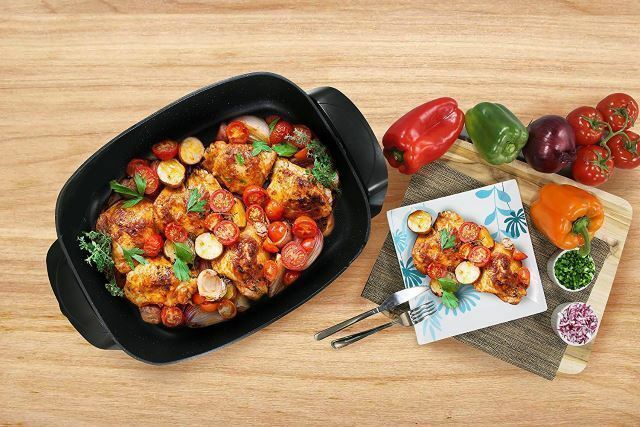 Further, this skillet is non-stick, dishwasher-safe, has a glass lid, and even features a pour spout for convenience. The handles stay cool to the touch throughout cooking, and finally, the ability to pack the base within the skillet greatly minimizes storage bulk. This electric skillet checks off all the marks for our criteria and certainly stands out above the others.